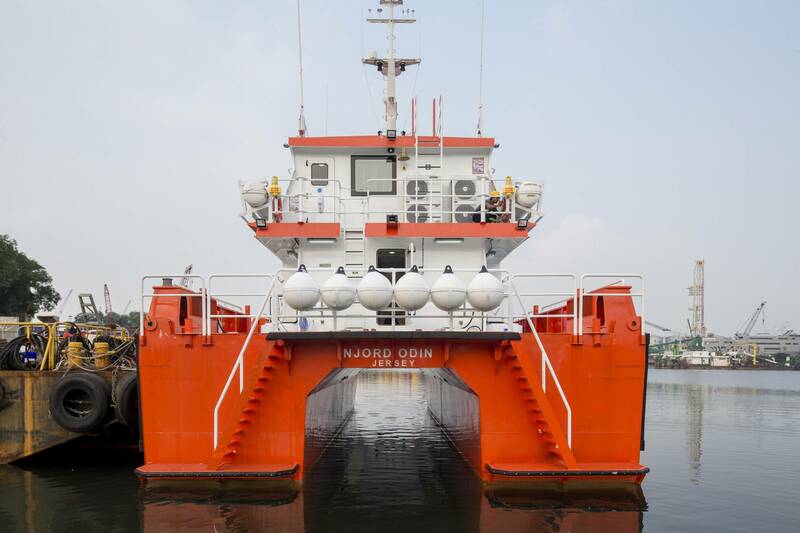 Strategic Marine delivered a world’s first to European windfarm service sector operator, Njord Offshore. This vessel builds on the success of the first eight 21m vessels built for Njord by Strategic Marine. The StratCat, a multi-purpose service vessel capable of transporting up to 24 crew, is first in its class in three particulars. The StratCat is the first of four in a series of 26m vessels ordered by UK-based Njord. Strategic, a member of the TriYards Group with facilities in Australia, Singapore and Vietnam, previously built eight 21m crew transport vessels for Njord which, like these larger new vessels, were purpose-made to spearhead the European windfarm service industry in quality, operability, and crew comfort. The StratCat cruises at 25 knots via quad installation of Volvo IPS drive units, each generating 700hp for total 2,800hp. The vessel is also capable of achieving 23knots in redundancy mode with one main engine down. Its intuitive joystick docking (main control, two wing joysticks and rescue zone joystick) and Dynamic Positioning System allow precision control when maneuvering onto a wind turbine, exceeding all performance standards at sea and ensuring the greatest possible safety during crew transfers. The boat boasts 77 sq. m. of clear deck and container carriage space, a SWL 2.5ton @ 8m knuckle boom crane, accommodation for 10, shower facilities, full galley and mess, provides a state-of-the-art transport vessel with comfort, handling and thrust capabilities second to none.